The House Captains led yet another exciting end of term House assembly at the end of Term 2 for Nursery children through to Year 6. 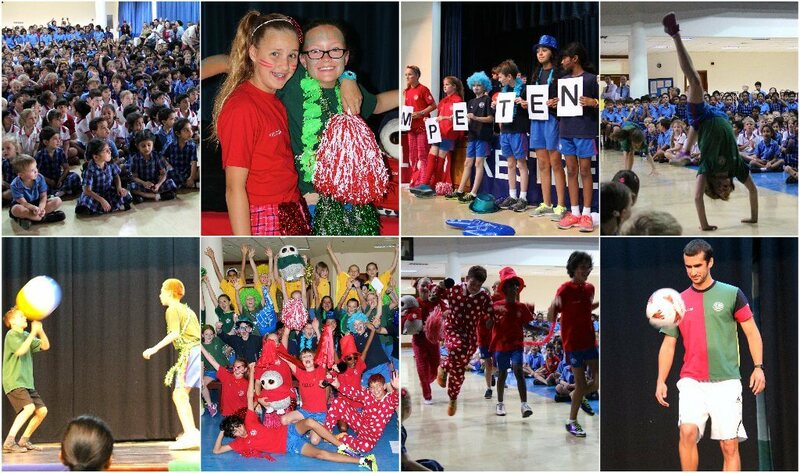 It was fun packed with videos showing the Houses on holiday t-shirt competition, Infants Sports Days and all the Inter-House competitions that have taken place this term. The House challenge saw the House Captains take on Sparta’s Coach Adam in the ‘keepy uppy’ challenge. Each House had to keep the ball in the air for as long as possible. What Adam didn’t realise is that the House Captains were using a beachball, while he had to use a football! To make it harder we combined the scores of all the Houses – a total of 80! Adam, still needed an extra challenge though! So to tie in with our Inter-House spelling competition they challenged him to spell ‘Competent Individual’ while keeping the ball in the air! A big thank you to Adam and well done to all the House Captains who helped us end the term on a high!